Northwest wineries are putting their scenic settings to good use by adding overnight accommodations. Guest rooms and restaurants draw in more visitors for longer stays. These facilities generate their own revenue and increase wine sales. The jack-of-all-trades world of winemaking requires a panoply of skills. Winery owners get daily exercise in tasks from chemistry to database management to mechanics--and that's just in the cellar. An afternoon in the tasting room means working muscles in customer service, wine education and gift shop management. But increasingly, Northwest winery owners are adding to their job descriptions, opening restaurants, lodges, even full-scale resorts where once they concentrated solely on selling wine. For some, it's a way to maximize the value of properties that can be beautifully pastoral. If there's an extra room in the old farmhouse now serving as a tasting room, why not rent it out to wine tourists? For others (like the Fries family, whose Desert Wind is shown above), it's the foundation of a business plan centered around wine sales, and buttressed by hospitality and all its myriad faces. A recurring philosophy runs through these vineyards, sort of a "Field of Dreams" approach to the wine business: If you build it, they will come. That was part of Jim Wyse's motivation when he expanded his facility at Burrowing Owl in southern British Columbia to include a guesthouse. Wyse planted his original acreage in 1993, and by 1997 decided to produce his own wines instead of selling his crop to other winemakers. 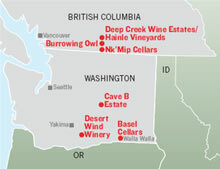 Today, Burrowing Owl produces 30,000 cases annually from the 140-acre estate. The gravity-flow winemaking facility, built on a plateau near the north end of Osoyoos Lake, opened in 1998, and the 50-seat restaurant called the Sonora Room followed in 2003 to capitalize on the Okanagan's blooming reputation for fine wines and food. By 2004, when he decided to double the capacity of the underground caves, Wyse began to envision a destination that would give tourists even more reasons to visit his winery. The 10-room guesthouse opened in January, 2007. Wyse says he is part of a growing trend in the Okanagan, where many wineries, most of them boutique facilities with limited distribution capacity, lure visitors to their grounds with restaurants or lodges. The various elements of these growing businesses are integrally tied together, each supporting the others. "Part of the reason for opening the guesthouse was to keep the chef busy during the off season," Wyse says. But in Canada, at least, there's no danger the peripheral businesses will ever exceed wine sales: The Agricultural Land Commission dictates that no more than 10 guestrooms can be offered at wineries as an alternative revenue source. One of 10 luxurious rooms in Burrowing Owl's new guesthouse. Still, a few large-scale resorts are popping up across the Okanagan region. The vast project at Spirit Ridge, for example, developed by the Osoyoos Band of the Nk'Mip tribe, includes Nk'Mip Cellars, along with Spirit Ridge resort, a campground, spa, golf course and cultural center, all operated as separate businesses, but each managed to complement the others. At Peachland, Scott Wilshire and Walter Huber found a way to wed a full-scale resort with a vineyard when Wilshire began developing Trepanier Manor Hotel, with Deep Creek Wine Estates & Hainle Vineyards as a hook. Hainle is a venerable name in Canadian wines, one of the first organic vineyards in the country and the first in North America to produce ice wine. Huber bought it from the Hainle family in 2002, with the intention of developing a hotel nearby. A few years later, Wilshire was searching for land to develop a 38-room hotel and 20 "vineyard villas," timeshare-style homes that will surround the vineyard. He and Huber are now partners in Hainle Vineyards. Trepanier Manor's 12 acres surround the 6 acres that make up the vineyards, creating a romantic wine-country site. Okanagan's Spirit Ridge resort project was developed by the Osooyos Band of the Nk'Mip tribe. Huber's vision of a hotel near his small winery (he will bottle only about 5,000 cases next year) is integral to his marketing plan. "We can't compete with the rest of the world because their wines are too cheap," he says. Hainle wines range from $17.90 Canadian (CAD$1=US$.94) for a 2002 Pinot Blanc, to $988 Canadian for a 1983 Riesling Ice Wine Estate Release. "The only way we can compete is by creating our own niche market. When I bought the winery in 2002, it was always with the intention of having a hotel with it. There's a huge demand for it. It's very romantic to stay in a vineyard." Across the border in the United States, a stream of Washington vintners is also picking up the trend. In Prosser, the little town at the confluence of the Columbia Valley and the renowned but minuscule Red Mountain AVA, Desert Wind Winery recently threw its hat in the ring. The Fries family has been making Duck Pond wines in Oregon since 1993. When they built the new Desert Wind facility in Prosser, they included plans for an expansive tasting room designed to handle weddings and other large events. The facility looms above Interstate 82, tempting travelers with a restaurant serving lunch and dinners on weekends, four guest rooms, plus a training kitchen where chef Gene Soto offers occasional cooking classes. General manager Carlos Trevino's career includes 18 years as the hospitality manager at neighboring Hogue Cellars, one of Washington state's earliest and largest wineries, but he says operating a bed-and-breakfast as well as a restaurant, along with the winery operation, is a whole new challenge. "I've been doing guerilla marketing," he laughs, hand-delivering menus and brochures about the facility to local businesses to attract a lunch crowd. A recent bridal fair at the facility showcased wedding services like limos and florists. And, like all the winery owners interviewed, he's concentrating his efforts on Desert Wind's e-mail lists and wine club members. That existing coterie of customers is a key ingredient in the winery-as-destination concept. Basel Cellars Estate Winery in Walla Walla, Wash., markets its estate as a perk reserved exclusively for wine club members. Bookings at the lodge are growing, and each one reflects a guaranteed sale of at least $500 in wines. To reach Basel Cellars, guests work their way down a winding, dusty road until they come to the huge gates marking the entry to the estate. The long driveway, lined with massive stone-anchored lights, leads to the crest of an imposing hill, site of a log and stone mansion that serves as the tasting room and guest lodge. Its rustically elegant design features patios with sweeping views of vineyards and the Blue Mountains beyond, and a secluded pool with naturalized landscaping nestled between the main house and a smaller cabana. A 9,600-square-foot underground garage that housed the former owner's car collection now serves as a barrel room, where the winery's 6,500-case production is nurtured. The facility is literally an estate. Greg and Becky Basel purchased the 13,800-square-foot house and grounds when it came on the market in 2001, recognizing its potential as a home for their young winery. It includes eight bedrooms, a large gourmet kitchen, exercise room, meeting space and a separate one-bedroom cabana. The lodge is popular for large groups, weddings and corporate retreats. Weekends are booked into 2008, and Becky Basel says mid-week bookings by corporate groups are growing. But she emphasizes some important differences between Basel Cellars and other home-based hospitality ventures. "We're not running it as a bed and breakfast," she says. Guests must rent the entire lodge, not just one or two rooms, and there is no restaurant, although the Basels will accommodate just about any request, from arranging limos for wine tours to bringing in a chef to prepare meals. And at $2,400 for a one-night stay, it's aimed squarely at higher-end wine tourists. More importantly, the lodge is available only to Basel Cellars wine club members, a group committed to purchasing at least $500 annually of Basel Cellars wines. So although it produces an income stream that helps support the winery's physical property, the lodge's purpose remains closely tied to the Basels' original business--selling wine. On the other end of the spectrum is Cave B Estate Winery and the Sagecliffe Project, a venture spearheaded by Vince Bryan III. Cave B's roots lie in rock and roll. The Bryan family wine legacy stretches back some 30 years, when Bryan's father first planted a vineyard on the rocky cliffs hugging the Columbia River Gorge near Quincy, Wash. The site of the original winery, Champs de Brionne, encompassed a breathtaking natural amphitheater, and the Bryans made good use of the scenery. Summer concerts there were legendary, with first-rate acts like James Taylor, Tom Petty and the Heartbreakers, Steely Dan and the Beach Boys performing on a stage framed by glorious sunsets over the Columbia River. Carloads of rock fans from all over the Northwest would flood the parking lots, arriving hours before the concerts to stake out the best spots on the grass, enjoying picnics and tasting Champs de Brionne wines at the tasting room. Cave B Estate Winery and the Sagecliffe Project are marketed with an emphasis on a total artistic experience. But the music almost swallowed the winery. State regulators grew more and more strict about allowing wine sales at the concert site, and in 1993 the Bryans left the wine business and sold the amphitheater, retaining some of the original vineyards. But for Vince Bryan III, son of the original Champs de Brionne owners, those early years of wine and song became the downbeat for his 21st century vision called the Sagecliffe Project. It encompasses Cave B Estate Winery, Cave B Inn at Sagecliffe, Tendrils Restaurant featuring estate cuisine developed by chef Fernando Divina, and a far-reaching vision bringing artists, scientists, intellectuals and wine lovers together, sharing the heady atmosphere at the destination Bryan is developing. "People would tell us that they had unbelievable, almost spiritual experiences at the amphitheater, being in that beautiful setting, enjoying good food and wine," Bryan says of the early years. "We're trying to create a place where people want to come to experience all those things together in a special environment. These are moments that you remember for a lifetime." So the resort is marketed with an emphasis on the experience. Guests might encounter resident artists at work, an orchestra in rehearsal, or a workshop led by a researcher in residence there. But this isn't a university--wine is a key part of the experience. Bryan says winemaker Rusty Figgins spends at least half of his time in the tasting room, face to face with customers. Guests can also roam the vineyards and the estate's vast organic gardens, where Divina culls many of the ingredients for his menus. To a wine consumer, Bryan explains, those personal experiences can sell more wine than a rating assigned by a critic. "It's impossible to be in the limelight all the time, but it isn't impossible to have people thinking about you and telling others about you. You have to give them reasons to think about you," he says. "There are only so many 90-point wines, but there are innumerable wine experiences." Anne Sampson is based in Richland, Wash., where she writes about wine and agriculture for publications including Northwest Palate, Good Fruit Grower, Wine Press Northwest and Washington CEO. Contact her through edit@winesandvines.com.